Coffee cake is typically a delicious cake that is topped with sweet streusel. 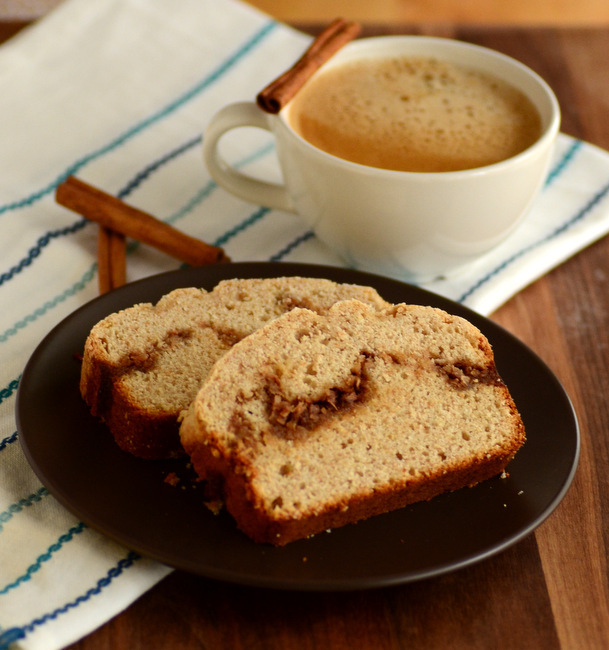 In the case of this Cinnamon Coconut Swirl Coffee Cake, the streusel is found inside of each slice instead of on top! This is a quick bread coffee cake that is baked in a loaf pan, featuring a vanilla and coconut cake that is swirled with a sweet mixture of brown sugar, cinnamon and shredded coconut. This loaf is easy to make and it’s an excellent choice of coffee cake if you’re looking for a recipe suitable for a smaller group or simple want a more streamlined recipe that doesn’t involve making a streusel topping. It’s also a standout option if you’re feeding a group that loves coconut, of course! The cake itself is scented with vanilla extract and made with coconut milk, rather than buttermilk or regular milk. I like to use canned coconut milk, as it typically has a nice coconut flavor and gives an excellent texture to baked goods. The majority of the canned coconut milk that I see in the store is reduced fat, and I recommend going for that here. While whole fat coconut milk can be used, it sometimes separates in the can and it can take a little bit of elbow grease to re-emulsify it. The type of coconut milk that comes in a carton can also be used, but it usually has a slightly thinner consistency and may make for a slightly less rich loaf at the end. Regardless of which type you choose, make sure it is unsweetened coconut milk. While there is coconut milk in the cake, most of the coconut flavor here comes from the swirl. The swirl is made with brown sugar, cinnamon and a generous amount of sweetened, shredded coconut. The coconut gives the swirl some substance and a nice chewiness, setting it apart in looks, flavor and texture from the rest of the loaf. Only give the mixture a gentle swirl as you layer the components of this loaf into the pan to avoid over-incorporating the coconut layer, giving the finished loaf a more dramatic swirl. This loaf is ready to slice as soon as it has cooled. While the cake itself isn’t overly sweet, the cinnamon swirl in the center adds just the right bit of additional sweetness to make this pair perfectly with coffee or tea. It is delicious on its own, but I often cut it in thick slices and lightly toast it before serving to warm it up. Once warmed, it is excellent with a bit of butter or a light smear of cream cheese. The loaf will keep well for a couple of days if stored in an airtight container. In a small bowl or measuring cup, whisk together coconut milk, egg, vegetable oil and vanilla extract. Add mixture to the bowl with the dry ingredients and stir until completely combined. In a medium bowl, mix together swirl ingredients: brown sugar, cinnamon, shredded coconut and salt. Pour half of the batter into the prepared pan. Pour coconut swirl mixture over the batter and spread into an even layer. Pour remaining batter on top. Run a butter knife once through the mixture in a swirling pattern to create a swirl. Bake for 45-50 minutes, or until a toothpick inserted into the center comes out clean or with only a few moist crumbs attached. Allow loaf to cool in the pan for at least 20-25 minutes before unmolding. Makes 1 loaf; serves 8-10.